# Iterate over fake node B's input 'in_file? As you can see, setting up a JoinNode is rather simple. The only difference to a normal Node is the joinsource and the joinfield. joinsource specifies from which node the information to join is coming and the joinfield specifies the input field of the JoinNode where the information to join will be entering the node. 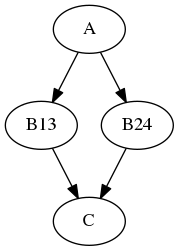 This example assumes that interface A has one output subject, interface B has two inputs subject and in_file and one output out_file, interface C has one input in_file and one output out_file, and interface D has one list input in_files. The images variable is a list of three input image file names. In this example, the node C out_file outputs are collected into the JoinNode D in_files input list. The in_files order is the same as the upstream B node iterables order. 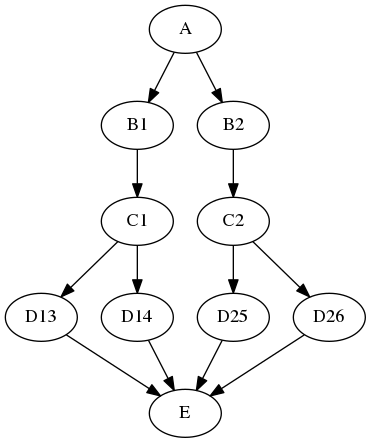 where B13 has inputs m = 1, n = 3, B14 has inputs m = 1, n = 4, etc. for B13 and B24, resp. In this example, all interfaces have input in_file and output out_file. 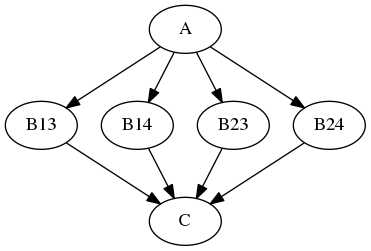 In addition, interface B has input m and interface D has input n. A Python dictionary associates the B node input value with the downstream D node n iterable values. 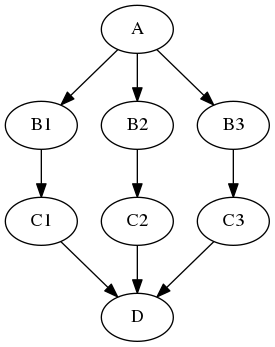 The combination of iterables, MapNode, JoinNode, synchronize and itersource enables the creation of arbitrarily complex workflow graphs. The astute workflow builder will recognize that this flexibility is both a blessing and a curse. These advanced features are handy additions to the Nipype toolkit when used judiciously. 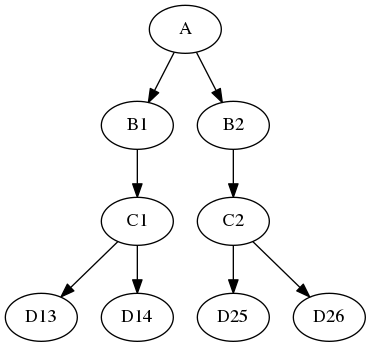 Let's consider another example where we have one node that iterates over 3 different numbers and generates random numbers. Another node joins those three different numbers (each coming from a separate branch of the workflow) into one list. To make the whole thing a bit more realistic, the second node will use the Function interface to do something with those numbers, before we spit them out again. """Generate a random number based on id"""
"""Scale the input list by 1000"""
[Node] Setting-up "testjoin.get_data" in "/tmp/tmpallwswjs/testjoin/_id_3/get_data". [Node] Setting-up "testjoin.get_data" in "/tmp/tmplyw137sg/testjoin/_id_2/get_data". [Node] Setting-up "testjoin.get_data" in "/tmp/tmpjrq52bq4/testjoin/_id_1/get_data". [Node] Setting-up "testjoin.scale_data" in "/tmp/tmpa4vcpwpf/testjoin/scale_data". Generated workflow graph: /home/neuro/nipype_tutorial/notebooks/graph.png (graph2use=exec, simple_form=True). We extend the workflow by using three nodes. Note that even this workflow, the joinsource corresponds to the node containing iterables and the joinfield corresponds to the input port of the JoinNode that aggregates the iterable branches. As before the graph below shows how the execution process is set up. [Node] Setting-up "testjoin.get_data" in "/tmp/tmpurv1ab1s/testjoin/_id_3/get_data". [Node] Setting-up "testjoin.scale_data" in "/tmp/tmphdccd_nu/testjoin/_id_3/scale_data". [Node] Setting-up "testjoin.get_data" in "/tmp/tmph559889y/testjoin/_id_2/get_data". [Node] Setting-up "testjoin.scale_data" in "/tmp/tmpidkaq4t9/testjoin/_id_2/scale_data". [Node] Setting-up "testjoin.get_data" in "/tmp/tmpmss2apc1/testjoin/_id_1/get_data". [Node] Setting-up "testjoin.scale_data" in "/tmp/tmp_yafi4jn/testjoin/_id_1/scale_data". [Node] Setting-up "testjoin.replicate_data" in "/tmp/tmped1rvpme/testjoin/replicate_data". You have list of DOB of the subjects in a few various format : ["10 February 1984", "March 5 1990", "April 2 1782", "June 6, 1988", "12 May 1992"], and you want to sort the list. You can use Node with iterables to extract day, month and year, and use datetime.datetime to unify the format that can be compared, and JoinNode to sort the list. #split_node.inputs.dob_string = "10 February 1984"
[Node] Setting-up "sorting_dob.splitting" in "/tmp/tmpezj8dmgv/sorting_dob/_dob_string_12May1992/splitting". [Node] Setting-up "sorting_dob.cleaning" in "/tmp/tmphh102ffs/sorting_dob/_dob_string_12May1992/cleaning". [Node] Setting-up "sorting_dob.datetime" in "/tmp/tmp7p1jfwkp/sorting_dob/_dob_string_12May1992/datetime". [Node] Setting-up "sorting_dob.splitting" in "/tmp/tmp9tl3l645/sorting_dob/_dob_string_June6.1988/splitting". [Node] Setting-up "sorting_dob.cleaning" in "/tmp/tmp2m_1nki_/sorting_dob/_dob_string_June6.1988/cleaning". [Node] Setting-up "sorting_dob.datetime" in "/tmp/tmpa3mt80s3/sorting_dob/_dob_string_June6.1988/datetime". [Node] Setting-up "sorting_dob.splitting" in "/tmp/tmpn3qjarnu/sorting_dob/_dob_string_April21782/splitting". [Node] Setting-up "sorting_dob.cleaning" in "/tmp/tmphbay6bx1/sorting_dob/_dob_string_April21782/cleaning". [Node] Setting-up "sorting_dob.datetime" in "/tmp/tmp0dubwg6o/sorting_dob/_dob_string_April21782/datetime". [Node] Setting-up "sorting_dob.splitting" in "/tmp/tmpospydkf7/sorting_dob/_dob_string_March51990/splitting". [Node] Setting-up "sorting_dob.cleaning" in "/tmp/tmpc3x_jvi6/sorting_dob/_dob_string_March51990/cleaning". [Node] Setting-up "sorting_dob.datetime" in "/tmp/tmpepegpwe0/sorting_dob/_dob_string_March51990/datetime". [Node] Setting-up "sorting_dob.splitting" in "/tmp/tmp4lwlc8tx/sorting_dob/_dob_string_10February1984/splitting". [Node] Setting-up "sorting_dob.cleaning" in "/tmp/tmprplt3p6y/sorting_dob/_dob_string_10February1984/cleaning". [Node] Setting-up "sorting_dob.datetime" in "/tmp/tmptukudtu7/sorting_dob/_dob_string_10February1984/datetime". [Node] Setting-up "sorting_dob.sorting" in "/tmp/tmpa6s4k__t/sorting_dob/sorting".